In this video Mark Donovan shows how to install a bottom door seal. Replacing a bottom door seal is easy to do and requires just a few tools: a screw driver, drill and drill bit, and a hacksaw. Over time an exterior door’s bottom seal can deteriorate and break. When this happens cold air can enter the house or garage and cause drafts. Drafts that end up costing you money in the form of higher heating bills. Fortunately even a beginner DIY’r can replace a bottom door seal in about thirty minutes. All it requires is a little willingness to make the effort and a few tools. For tools, all that is required is a screwdriver, a drill and drill bit, and a hacksaw. You can purchase a U-shaped bottom door seal at any home improvement store for less than $20 dollars, and most will fit any standard exterior door. To install a bottom door seal first remove the old one. You can often just use your hands to pull it away from the bottom of the door. However, a screw driver or a small pry-bar can also help. Once you’ve removed the old bottom door seal slide the new one in its place and mark with a pencil where you need to trim the excess material. Then use a hacksaw to cut the excess material. Even scissor can work to cut the excess material. Next slide the U-shaped bottom door seal into place and use your pencil to mark the door where the screws should be installed. Then, using a drill and drill bit that is 1/2 the diameter of the screws that came along with the replacement bottom door seal, drill pilot holes in the door where you made the pencil marks. Next, use the screwdriver to attach the screws to the door. Finally, swing the door closed and then open it up, checking that the bottom door seal makes a tight seal with the bottom of the door frame. 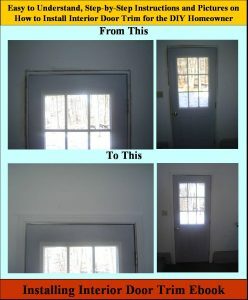 For information on how to install interior door trim, see the “Installing Interior Door Trim” eBook from HomeAdditionPlus.com. The “Installing Interior Door Trim” eBook provides step-by-step instructions on how to install interior door trim. Pictures are included for every key step in the process.